You can't beat a good old cheese and ham toastie; but why go the effort of going out and getting one when you can make one from the comfort of your own home thanks to the best sandwich makers? Whether your current sandwich maker has packed up or you're a toastie maker virgin, let us guide you with the best models from budget to healthy options, deep sandwich makers and multi-purpose ones which can also cook meats, waffles and eggs, too. With your favourite fillings at the ready, let’s get down to the top five sandwich makers on the market. For more kitchen appliance recommendations, head over to our appliances hub page for plenty of advice. 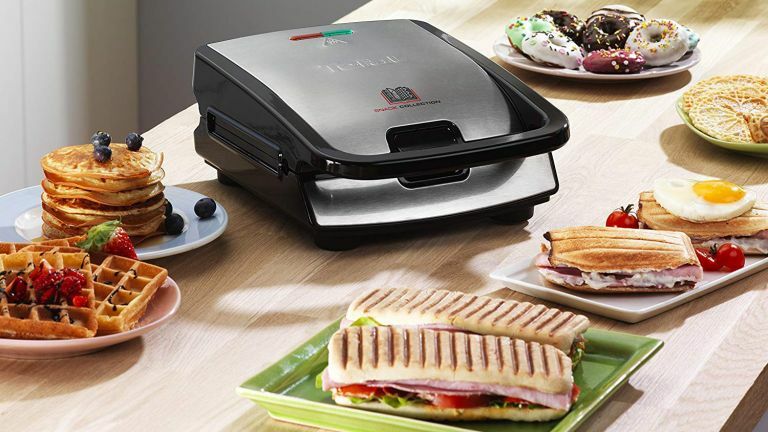 While some do a grand job of creating a classic toasted sandwich, others are impressively multi-functional, allowing you to grill vegetables and fatty meats, cook up the perfect panini and even allow you to make waffles. Sandwich makers tend not to be the most attractive gadget to have out on your kitchen worktop, however, many are compact enough to fit into a cupboard when not in use. If looks are important for your kitchen, opting for brands such as George Foreman or Cuisinart will offer you slightly softer designs that do a great job of toasting sandwiches and looking good on the work surfaces, too. If your family loves a toastie or two, look for one with four plates to avoid waiting times! There’s no point spending £50 on a sandwich maker that does it all when you dislike anything made from batter. Instead, spend half as much on a device that does just what you need it to — toast a good sandwich! The first specification to look out for when shopping around for sandwich toasters is how it handles its fill. This one, for example, has the capacity to toast you one heck of a sandwich, or 4. With its deep fill plates allowing for maximum packing of ingredients, don’t be scared to cram in mounds of cheese, tomato, onion, ham, mushroom and anything else that takes your fancy. If the cheese happens to ooze out a little, the plates are removable, allowing for easy cleaning and a mega convenient lunch. If we are talking about finding a truly decent sandwich maker, this machine does only this... and users reckon it does it really well. Our pick of the very best sandwich maker you can buy. Browse more Breville products on their Amazon page. If fuss-free is your approach to life, you’ll love this two-in-one device from Cuisinart. Stuff a sandwich with your favourite cheese at lunch, then go for something a little lighter on the stomach for dinner. Cooking on a grill is renowned for reducing the amount of fat that is contained within a piece of meat. The fat drips out of the meat while it’s cooking, and collects in the grill rather than being transferred back to the meat as it would when roasting or pan frying. You can easily change up the plates from grill to toastie maker and remove them for cleaning once you’re done with creating your meal. This is also the best sandwich maker for panini on our list as you can just slide them straight onto the plates and the weight of the plates will grill the panini evenly. Shop more Cuisinart products on their Amazon page. The best sandwich maker for those who don't like to skimp on luxury no matter what they're buying, the sleek yet very substantial Sage SSG600BSS sandwich maker is the best of the best. Thanks to the machine's adjustable height control, it's the only way to enjoy a light and fluffy toasted sandwich that's still crisp on the outside. It can be used for open melts, paninis, wraps and much more thanks to its flat bottom and top cooking plates, and it works fast thanks to the 1500W of power behind it. Once used and cool, the machine can be easily washed as its plates are covered in PFOA-Free non-stick coating, and in terms of storage, it's compact so can be easily popped vertical in a cupboard away waiting for next use. The best sandwich maker for those after a cheese toastie with a slice of luxury, we think. When marmite on toast just won’t cut it, knock up some fluffy waffles with this 3in1 sandwich maker. With a recipe included, just make sure you’ve got eggs, milk, flour and your favourite topping to hand. Once done, remove the waffle plates, put them in the dishwasher and pop on the panini grill ready for lunch. This machine isn’t the most expensive on our list yet certainly offers the most in terms of meal variety and ease of use. With that the case, there’s no reason why you shouldn’t make this machine your best buy of the year. If you like the idea of a toastie machine but you are not sure how often you will really use it for the purpose of making toasted sandwiches, the variety offered by this machine makes it excellent value for money, and one of our top picks of the best sandwich makers. Shop more Russell Hobbs products at their Amazon page. Anyone who has grilled sausages or burgers, knows how much fat is hidden in meat. Cleaning the grill after an indulgent breakfast is a nightmare, even when you cleverly put a piece of tin foil in the bottom of the tray to catch the worst of the dripping. Now, with the George Foreman, you can visibly see how much fat siphons off your food as it cooks and you can clean the nonstick surface of the evidence easily after you’ve finished. Create quick meals for you and your partner; toasted panini's, grilled chicken, charred steak, all in a matter of minutes. This machine isn't necessarily designed for creating toasties so be careful overfilling your toasted sandwich with cheese when using this device, it can be tricky to clean after, but for anyone wanting to grill chicken and then pop it into a panini and then back on the grill, this machine will definitely have you covered. See more George Foreman products on their Amazon page. For those who like to make a meal out of things… or in other words, take things to the extreme. There’s no point sticking to a plain old cheese and ham toastie for lunch, when this machine packs enough room to create something as extravagant as a breakfast toastie - egg, bacon, sausage, mushroom, hash brown - pack the lot in there to create the ultimate sandwich that will keep you full for hours. Once you’ve finished making your masterpiece, the plates can be easily removed and put in the dishwasher for ultimate convenience. If you are looking for a toastie machine that can create large toasted sandwiches, this is the best on our list for deep filled snacks. Whether it's a toasting bursting with flavoursome ingredients or sweet waffles on Sunday morning, this versatile sandwich maker is ideal for a whole host of snacks. With 16 different plates to collect, there will never be a moment where you can't rustle up something tasty with Tefal. The ready light will indicate when it's time to add your ingredients and the plates are super easy to clean and maintain. Just pop them in the dishwasher when you're done. Easy. Shop more Tefal products at their Amazon page. If you want large, deep fill sandwiches without a really bulky machine, then this Slater model is the best sandwich maker for you. The extra large plates are able to accommodate two sandwiches, and the non stick plates mean that any filling spilled will be easy to clean up and you can remove the sandwiches without any breakage. with the temperature control you can determine just how toastie you like your bread, and melt cheese to perfection! Shop more Salter products at their Amazon page. For a budget sandwich maker that is easy to use and compact enough to store away in your kitchen cupboard, opt for this LOGIK model. It has some handy added features, such as non-stick plates, a light to tell you when the machine is hot enough for your food, and handles that are cool to the touch. An ideal purchase if you'll only be using your sandwich maker every so often and simply want a perfectly toasted outcome. In our opinion, this is the best sandwich maker for those on a budget, including students. Shop more sandwich makers at Currys PC World.